Canada’s WestJet appears to be taking a predictably measured approach with the debut of its new regional subsidiary Encore in Jun-2013, keeping the majority of the new carrier’s operations close to its Calgary base until its calculus for the 78-seat Bombardier Q400 is proven out. As expected, WestJet is heightening competition with Air Canada in some of the small markets where it plans to deploy Encore’s turboprops, but is also introducing new points from some of those airports. WestJet is also not ignoring mainline expansion, reflected in the launch during 2H2013 of two new US markets – the Dallas hub of partner American Airlines and Myrtle Beach, South Carolina. WestJet has moved quickly in its development of Encore, disclosing plans to expand into the regional market in early 2012. After unveiling its desire to create a new carrier WestJet’s management worked to attain employee approval for the establishment of Encore, ordered 20 78-seat Bombardier Q400s and determined that Calgary (WestJet’s headquarters location) would serve as the initial base for the new carrier. The airline had to slightly delay unveiling Encore’s initial routes from 21-Jan-2013 to 11-Feb-2013 to ensure some IT changes it was making were in place. WestJet has officially announced that Encore will launch in late Jun-2013 with two Q400s on service from Calgary and Vancouver to Fort St John, from Calgary and Nanaimo and between Vancouver and Victoria. All of those markets were included in a list WestJet displayed to investors in late 2012 of destinations served by Air Canada’s regional carriers that were potential targets for Encore. WestJet has estimated Air Canada Express operates to roughly 30 markets the low-fare carrier is currently not serving, leading WestJet to conclude it has significant opportunities for expansion in the Canadian domestic market by operating smaller aircraft. In addition to targeting new markets with Encore’s Q400s that are too small for WestJet’s mainline Boeing 737 narrowbodies, smaller-gauge turboprops are also being deployed in WestJet’s existing markets to offer better schedules for business travellers. WestJet has been working aggressively to broaden its reach among the corporate customer segment through the addition of new business markets, bolstering its schedule in eastern Canada and making changes to its loyalty scheme to make it attractive to business customers. WestJet is scheduled to accept a total of seven Q400s in 2013 – two in Jun-2013, and a single aircraft per month between Aug-2013 and Dec-2013. Located in the province of British Columbia, Fort St John has strong ties to the oil and natural gas industries, and was on a list of underserved cities that WestJet CEO Gregg Saretsky cited early on as markets ideal for Encore’s entry. WestJet’s schedule is a Calgary-Fort St John-Vancouver routing, and the new Encore flights are creating new links from Calgary to Fort St John. 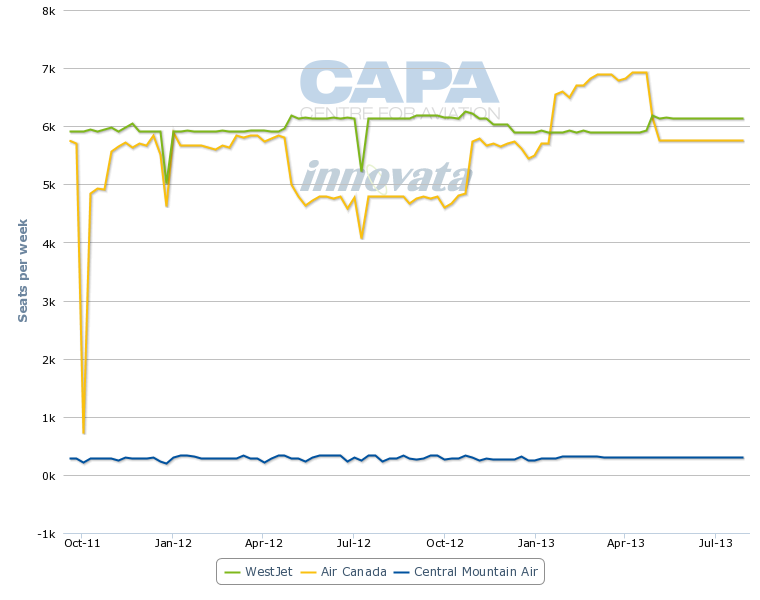 According to current schedules in Innovata (11-Feb-2013 to 17-Feb-2013), Fort St John is only served by Air Canada and smaller regional carrier Central Mountain Air. Air Canada serves Fort St John from Vancouver, and based on estimates from Innovata will offer roughly 1,914 one-way seats weekly in the market when WestJet’s launches its flights to Fort St John from Calgary and Vancouver in Jun-2013. Presently, Air Canada operates 50-seat Bombardier CRJs flown by its main regional partner Jazz between Vancouver and Fort St John. Nanaimo is also located in British Columbia on Vancouver Island and is most well-known for its status as “Bathtub Racing Capital of the World”. It is a short flight from Vancouver International Airport to Nanaimo Airport, which is only served on that sector by Air Canada. Similar to Fort St John, WestJet will add Calgary as a market from Nanaimo when the service launches in Jun-2013. Customers might find the direct flights attractive if their ultimate destination is Vancouver Island, allowing them to bypass Vancouver International. Victoria is also located on Vancouver Island, and WestJet is the airport’s largest carrier, accounting for a 40% seat share and 57% of its ASKs. Schedules in Innovata show that WestJet operates service from Victoria to the Canadian domestic destinations of Calgary, Edmonton, and Kelowna, and transborder service to Honolulu (once weekly), Las Vegas (twice weekly) and Phoenix (once weekly). WestJet also operates a single weekly flight to Puerto Vallarta. Presently Air Canada and Vancouver-based Pacific Coastal Airlines operate in western Canada. Air Canada accounts for approximately 86% of the seats on offer between Vancouver and Victoria. WestJet’s service that arrives in Victoria at 19:55 and departs at 07:14 the next day is not a huge threat to Air Canada, which offers multiple daily flights between Vancouver and Victoria. WestJet also appears to be launching more direct flights between Calgary and Grand Prairie in Aug-2013. The carrier’s website shows one direct flight on the pairing, while online route tracking site Airline Route via the GDS system shows new daily nonstop Q400 service beginning in 2H2013. The initial Encore routes seem to fit the mission profile of the Q400 and are close enough to WestJet’s Calgary base to ensure that any aircraft operational issues can be resolved relatively quickly. The distance between Calgary and Fort St John is about 449 miles (720km), while the distance from Calgary to Nanaimo is 460 miles. Grand Prairie and Calgary are 346 miles apart while the distance between Vancouver and Victoria is a mere 39 miles. WestJet is also using the Q400s delivered during 2013 to fortify some of its existing routes and offer better schedules and perhaps more appropriately match supply with demand at certain times of the day. Beginning in Aug-2013 WestJet plans to replace one of seven daily flights between Calgary and Edmonton, which is the airline’s sixth largest domestic route based on seats deployed, with a Q400. At the moment Air Canada has a 52% share of the seats on offer from Calgary to Edmonton, with WestJet representing a 46% share and Central Mountain Air holding a 3% stake. Prior to schedule changes that include markets where Encore’s Q400s are being deployed, WestJet’s share was set to increase to 50% in May-2013 while Air Canada’s share was dropping to 47%. Starting in Sep-2013, WestJet plans to bolster daily frequencies in the market to nine, with four of those flights flown with the 78-seat turboprops. WestJet’s fleet of Boeing 737s – 13 -600s, 69-700s and 18-800s – have a seating capacity of 119, 136 and 16-seats, respectively. Also in Aug-2013 WestJet is replacing one of four daily flights between its Calgary base in Regina with a Q400. 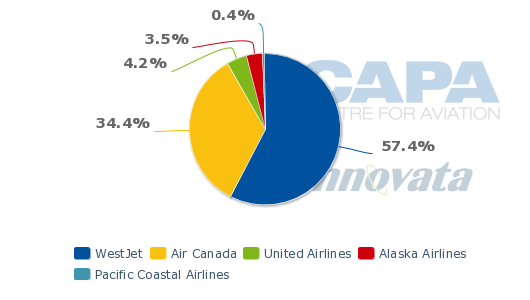 Presently, WestJet is the leading carrier on the pairing in terms of the approximate 5,054 seats on offer – holding a 69% share while Air Canada has the remaining 31%. Other deployments of the Q400 on existing mainline routes include Calgary-Saskatoon, which is increasing from four to five daily flights in Jun-2013. The Q400s will operate on one of the five daily services. WestJet already has a commanding share of the roughly 5,403 seats on offer in the market of 61% compared with a 39% share held by rival Air Canada. Beginning in Aug-2013 WestJet also plans to replace one of two daily flights between Edmonton and Grand Prairie with a turboprop. 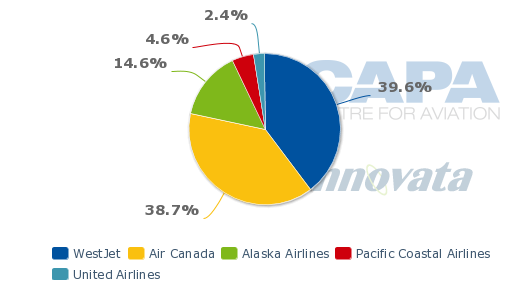 Like Calgary-Saskatoon, WestJet is the largest carrier on the Edmonton-Grand Prairie pairing, holding a 61% share of the roughly 3,807 seats on offer while Air Canada has the remaining 39% stake. As it rolls out the initial service for Encore, WestJet is also introducing new service to the US and bolstering frequencies on existing mainline domestic routes. On 29-Apr-2013 WestJet is launching service between Calgary and Dallas/Fort Worth, the hub of one of its US partners American Airlines. Presently, American offers 1,960 seats in the market. American and WestJet announced their partnership in Oct-2010, and now American is one of WestJet’s eight codesharing partners (other codesharing partners are Delta, Cathay Pacific, British Airways, Korean Air, KLM, China Eastern and Japan Airlines. WestJet also has several interline partners). The new service from Calgary to Dallas is logical given it links WestJet’s headquarters and main base in Calgary and American’s hub and headquarters in Dallas. The new pairing allows American and WestJet to extend their codeshare, and gives WestJet passengers the availability of three daily round-trips between Calgary and Dallas, and allows for connections to American’s flights beyond Dallas. During May-2012 WestJet is also introducing twice-weekly service from Toronto Pearson International to Myrtle Beach, taking aim at Porter Airlines, who serves Myrtle Beach from Toronto City Centre Airport seasonally in the winter and fall. WestJet is operating 737s compared with 70-seat Q400s flown by Porter. WestJet has concluded Myrtle Beach, a leisure and popular golfing destination, draws a large number of Canadian travellers. The service to Myrtle Beach is notable given that WestJet has made a push into larger US business travel markets during the last year including New York LaGuardia and Chicago. It also indicates some increasing competition in the transborder market between WestJet and Porter. Both carriers serve the New York market from Toronto – Porter operates flights from City Centre to Newark while WestJet operates flights from Pearson to New York LaGuardia. WestJet during the summer high season is also increasing frequencies between Calgary and Los Angeles and Toronto and Orlando. In the domestic market, WestJet is increasing frequencies from Toronto to Vancouver, Edmonton, Calgary, Saskatoon and Regina as well as introducing new service between Toronto and Fort McMurray. WestJet will break Air Canada’s monopoly from Toronto to Fort McMurray, where Canada’s largest carrier currently offers 1,845 weekly seats. Beginning in May-2013 Air Canada’s approximate seats on offer in the market are scheduled to increase to 2,327. The increased mainline frequencies from Toronto, Encore’s debut and other expansion are lifting WestJet’s domestic capacity by 5% to 6% for full-year 2013 compared to flat to 1.5% growth in domestic supply from Air Canada. The disparity reflects Air Canada’s focus on expanding internationally through the launch of its new low-cost carrier Rouge and increased mainline service to Asia. WestJet’s conservative approach to the launch of its new regional carrier Encore is sensibly cautious, given that the new airline represents a major change in WestJet’s business model through the additional complexity of a second fleet type. WestJet is not making an aggressive assault on Air Canada in its initial roll-out of new Encore routes, but with WestJet’s estimates that the Canadian domestic and US transborder regional market has a value of CAD2 billion (USD2 billion), the battle line has been drawn and the two long-time rivals will find themselves meeting more often.